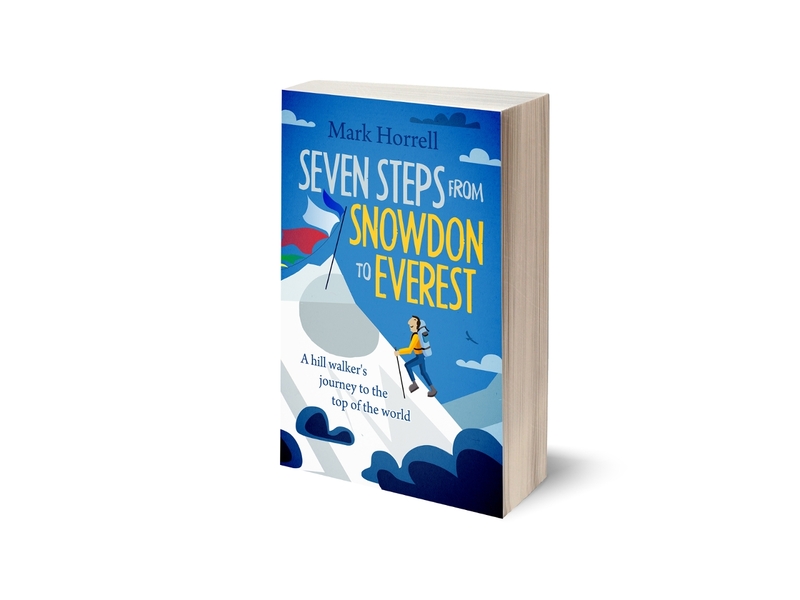 Another short one for you today (said the bishop to the actress), as I’m still trekking in Langtang as you read this, somewhere close to the summit of a mountain (unless you’re reading it a few weeks later, in which case I could be anywhere). 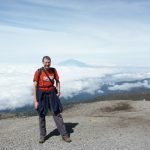 I’ve talked a bit about the glaciers on Kilimanjaro, and how they are shrinking at an alarming rate, but what about the climate on the rest of the mountain? In January, the NASA Earth Observatory released this fantastic aerial photo of the whole mountain, taken by its Earth Observing-1 satellite. It illustrates the different climate zones quite clearly using nothing but the mountain’s natural colours. The colours are so distinct that I’m going to try and describe the zones to you using the original photo, without annotating it in any way. My apologies if you happen to be colour-blind – in which case you can click on the image to go to the NASA Earth Observatory’s site, where they have an annotated version. But first, here’s the photo. 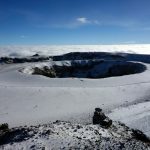 As you can see, Kilimanjaro’s central summit, Kibo, is obvious from the volcanic crater in the centre of the shot, but you can clearly see its other two peaks Shira and Mawenzi too. Shira is the small black circle on the left, with a clear ridge bounding it to the west. Mawenzi is the more jagged peak disappearing off the right-hand side of the photo. Cultivation (below 1,800m). These are the light green areas both north and south of the mountain. Originally all this would have been forest, but the trees were cut down to support crops and settlements. The boundary of light green and dark is also pretty much the same as the national park boundary. Forest (1,800m – 2,800m). These are the dark green zones that fringe the mountain on all sides. As you can see, the forest band is much narrower band on the north side. We discovered this for ourselves when we trekked in by the Rongai Route and passed through it fairly quickly (although this is partially explained by the fact that Edita was leading, and I have a hard time keeping up with her). Heather (2,800m – 3,200m). Towards the top of the forest zone you can see the dark green merging into brown. This region is often embraced in mist, though it must have been a clear day when NASA’s satellite took the photo. 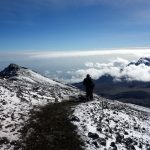 This is a region of giant heath plants and Kilimanjaro’s famous giant groundsels (senecio). Moorland (3,200m – 4,000m). These are the dark brown regions most clearly illustrated by the Shira Plateau between Shira and Kibo. Senecio and heather grows here too, but it’s much sparser between areas of dry grass, dust and sand. Alpine (4,000m – 4,800m). 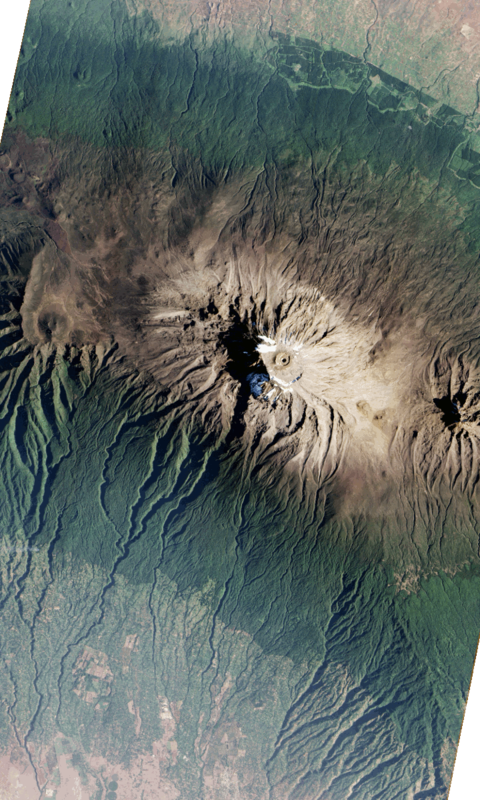 These areas are a lighter brown, and they are most clearly illustrated by the Saddle between Kibo and Mawenzi. Very little grows at this altitude, and the land is rocky desert and sand. Mountain (above 4,800m). There appears to have been quite a lot of snow when NASA’s satellite took the photo, particularly on the south-east side of Kibo, but the mountainous areas would be obvious anyway from the ridge lines and shadow surrounding the summits of Kibo and Mawenzi. Glaciers (above 5,600m). You can also see plainly that there aren’t many glaciers remaining on Kilimanjaro, but if you look closely you can see a couple of white streaks. The most obvious one is the Northern Icefield to the north-east of the crater. The next biggest is the Southern Icefield which merges into the Rebmann Glacier. These form the thinner streak of white to the right of the blue patch (which I assume must be cloud). My thanks to a reader Luca Calcagni for pointing out this photo to me. I hope you found it interesting too. Next week I will be back from Nepal and hopefully normal service will be resumed. 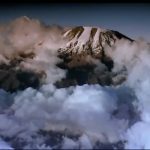 Mark, on your videos https://www.markhorrell.com/blog/2017/a-night-on-kilimanjaros-summit-the-videos/ the glaciers appear quite extensive, but on that satellite photo it looks like there’s hardly any ice left! Is it an optical illusion or are they really melting that fast?